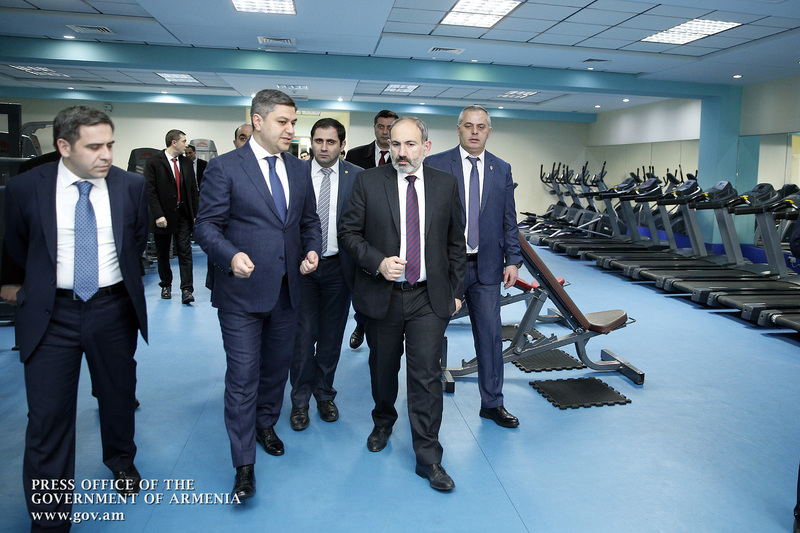 Accompanied by the President of the Armenian Football Federation (AFF) Artur Vanetsyan, Prime Minister Nikol Pashinyan visited today the Football Academy of Armenia in Avan District of Yerevan. The Premier toured the premises, inspecting the amenities available and the existing infrastructures. 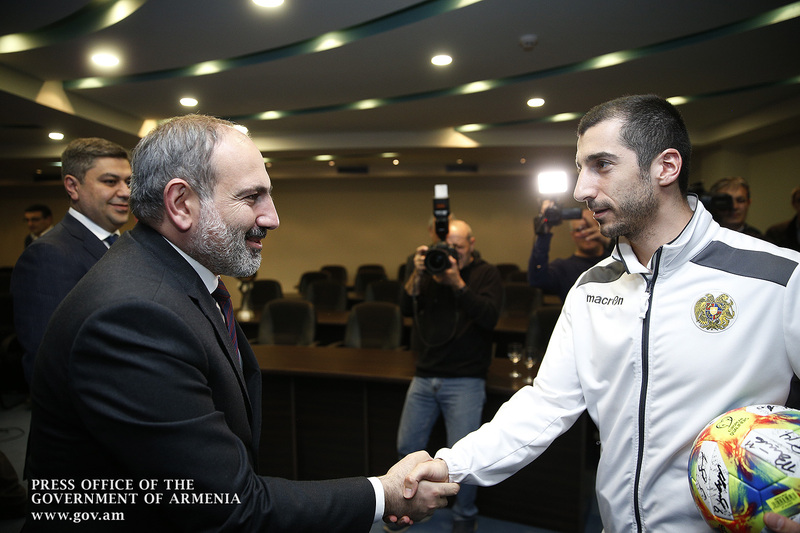 The AFF leadership presented to Nikol Pashinyan the ongoing programs and the future plans for developing football in our country. 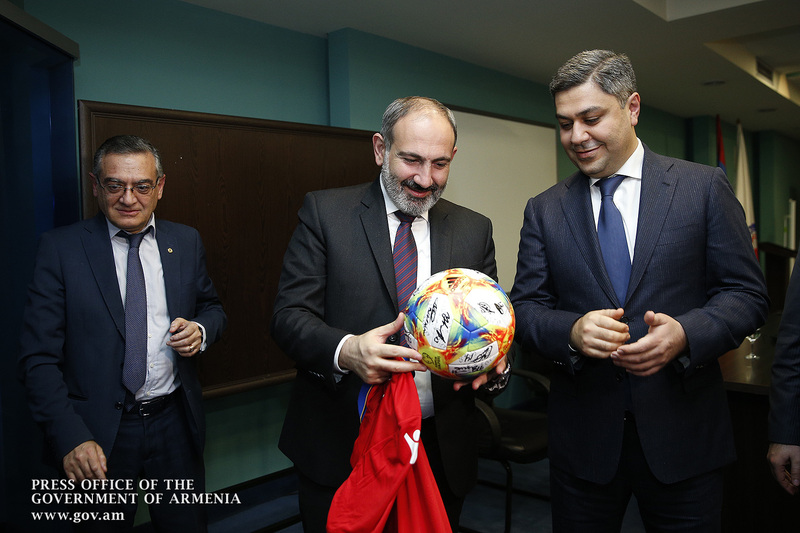 The Head of Government met with the coaches and players of Armenia’s national team who were getting ready for the Armenia-Finland match to be held on March 26 at the Republic Stadium in Yerevan as part of the qualifying round of Euro 2020. Armenian national team captain Henrikh Mkhitaryan presented Nikol Pashinyan with a T-shirt and a ball with the national team players’ signatures. 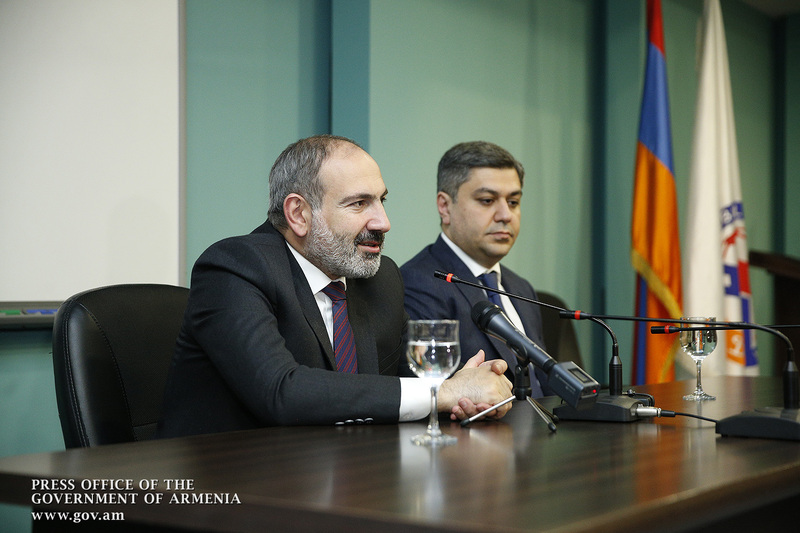 Addressing those present, Nikol Pashinyan noted: "Dear coaches, players, and representatives of the Armenian national team, I am happy to meet with you in such a format, and I do not think we need to say how important football is for us, how many opportunities can be created through football. We were just discussing the prospects for developing football in Armenia. The core of our discussion was that the content of public life and relationships can be changed through football. It can change people’s health status and self-esteem as a citizen, as a community. Of course, football can also change the social moods and the atmosphere in the country. To be honest, this is what makes me believe that sports, in general, and football, as the most popular sport, are important to public life. Of course, the Armenian national team has a special significance in this regard. The national team has offered us many joyful moments of excitement during its history. I have watched the national team’s games many times before both at the stadium and in family, and it has always been a great pleasure. We were pleased when the result was satisfactory, and we were proud to be with our team at challenging moments if it did not satisfy us. In this regard, I hope we will boast new achievements soon. I hope the spirit we have today in the Republic of Armenia in terms of public life could positively affect the national team’s performance. I feel that the psychological aspect is extremely important in football and in any sports, and I am sure that there are high-level professionals here. I believe that the public’s support is crucial in any professional activity. I wish you every success first of all in tomorrow’s game, but I do believe that your fans and the people of Armenia should prop you up psychologically regardless of the result. The psychological burden should be as light as possible and our team should not have any fear of the game in the well-known logic. The outcome of the game is indeed important, but as the Prime Minister of the Republic of Armenia, I am ready to share any bitterness with our team. Of course, there is even no need to share the joy, but be assured that I am always ready to share the bitterness with you. Therefore, you should be convinced that all Armenians, including me, we are with you on the pitch. I hope you will be playing to a full house tomorrow as I feel it extremely important, and I will be present at the stadium. While I cannot say whether it is applicable to football or not, but my experience evidences that the most important precondition of any victory is not to be afraid of losing. As soon as we are scared to lose, we find ourselves in a deadlock, afraid of taking an action. It is important not to be afraid of losing as it makes it much easier to keep abreast. You should simply do your utmost and see what will happen. I believe in our team, I appreciate and love all of you because the Armenian national football team is one of the most important national and state symbols. With our emotions, we have to do our best to make sure that the symbol feels confident and strong on the feet. If what is written in Armenia’s Football Development Plan is implemented, there is no doubt that we will have serious achievements. First, we must have them in mind, and we will win because we have the needed abilities. I would like to thank you for the work you have done. I also wish to thank the old-timers for having been at the roots of our national team, as well as for facing its misfortunes and victories. I wish the newcomers good luck and every success." According to Nikol Pashinyan, what matters most in any mission is to be honest and to believe in the final success. "At the national level, the players’ mission is very important. For example, while formulating the Government’s mission, I stressed that our chief task was to make people believe in themselves more and more, believe that they can have the power to change their lives and achieve their dreams. In my opinion, the mission of the national team is more important because if the national team plays well, every citizen of Armenia and every Armenian will feel more confident in their daily work the next day and onwards. Therefore, I wish you every success in your mission because your success is the success of each one of us," the Prime Minister emphasized. 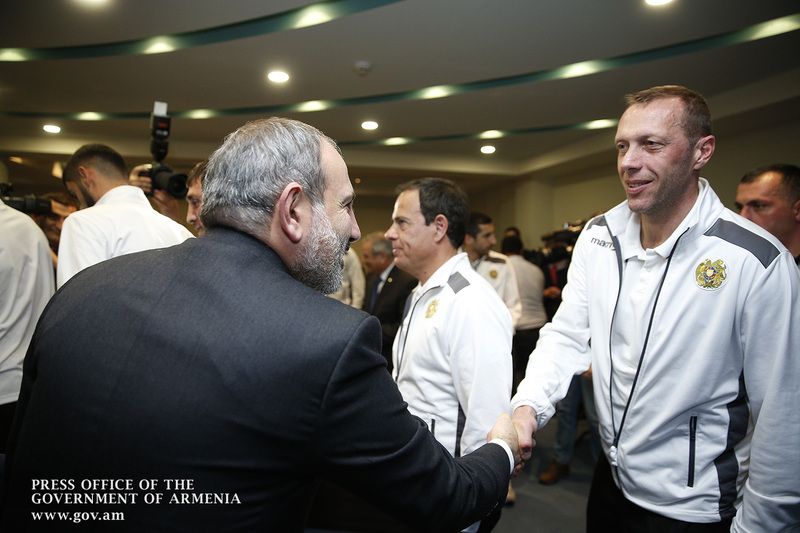 AFF President Artur Vanetsyan thanked the Prime Minister for visiting the Academy and meeting with the national football team members. The AFF President assured that the moral-psychological atmosphere in the national team is at high level, and the players are all in good shape. "We are getting ready for tomorrow’s match, and for the forthcoming games. We will show a very good performance. We believe that the guys will come out victorious tomorrow and will win the match. As you mentioned above, we will be next to the players. The victory is indeed quite promising, and we all believe that we will boast a win tomorrow," Mr. Vanetsyan said. Grenke Сhess Сlassic: Levon Aronyan Shares a Point with Georg Meyer In the first round Levon Aronyan had shared a point with Arkadij Naidich playing with white pieces. On April 23, in round 3 the Armenian GM’s opponent will be Spanish Francisco Vallejo. European Championship: 2 Wins and 3 Losses in Penultimate Round Before the last round Lilith Mkrtchyan has 6,5 points, Elina Danielyan, Siranush Ghukasyan and Maria Gevorgyan - 5,5 points each and Anna Sargsyan – 4 points. Consultation on Hosting the CONIFA 2019 European Football Cup in Artsakh State minister, head of the state commission Grigory Martirosyan and other officials partook at the consultation. PM Watches Armenia-Finland Football Match at Stadium Prime Minister Nikol Pashinyan attended Armenia-Finland football match, which was held at the Republican Stadium of Yerevan as part of the qualifying round of the 2020 UEFA European Football Championship.